All products you sell or stock should be entered in Linnworks. Each product and its variation has its own, unique SKU (Stock Keeping Unit), or in Linnworks we quite often refer to it as Item Number. Physical stock level – how many you actually have in stock. On order – how many are expected to be received from supplier following placed purchase order. Minimum Level – to alert the system of the minimum threshold for the stock level. Available – this is dynamically calculated value i.e. Physical stock level minus in open orders. Sale - Shipping as part of the order. The stock level will only be deducted once the order has been shipped. Resent – when an item gets lost in the post or the customer requires a replacement. Stock value – the system is capable of keeping track of the stock value. Stock value is a dynamically tracked value of the stock – it is determined from the cost of the products you have purchased to populate the stock level and any direct adjustment. This is NOT PurchasePrice x Quantity. 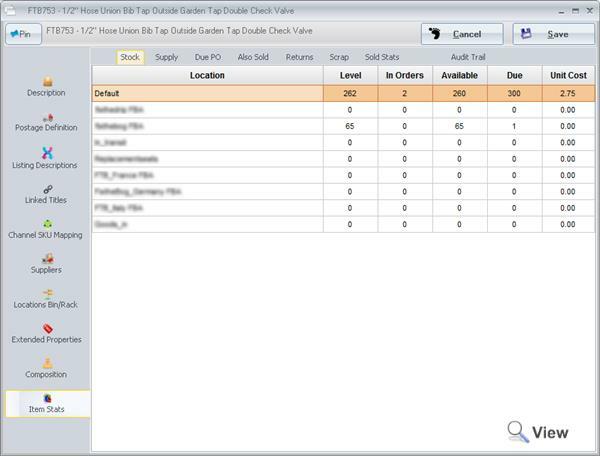 Purchase – when a purchase order is placed, On Order level will be increased. 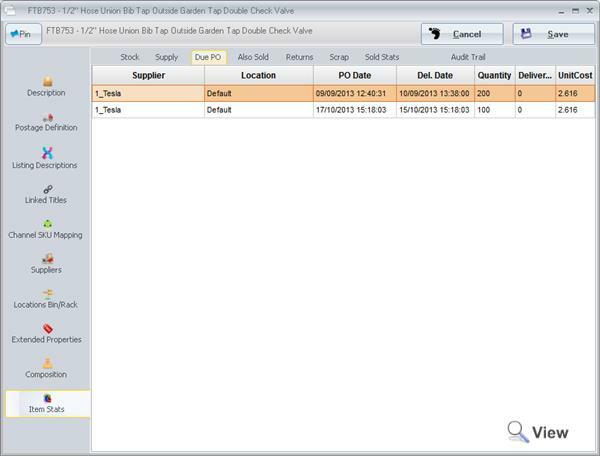 Once the purchase order is marked as delivered/partially delivered – level on order will be moved to actual stock level. Returns – when an item is returned to you by the customer and you wish to place the item back in stock for resale. 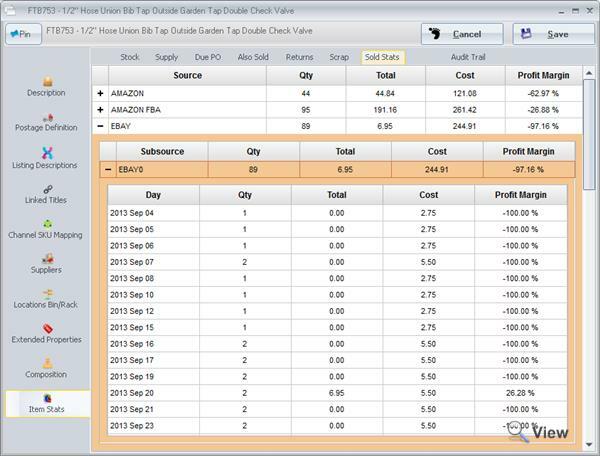 Direct adjustment – you change the stock level manually using Stock Adjustment screen. Stock In – you can book stock in when as you receive it from the supplier. Each stock may have multiple stock level – the concept of multiple locations allows you to have multiple stock levels for the same product. 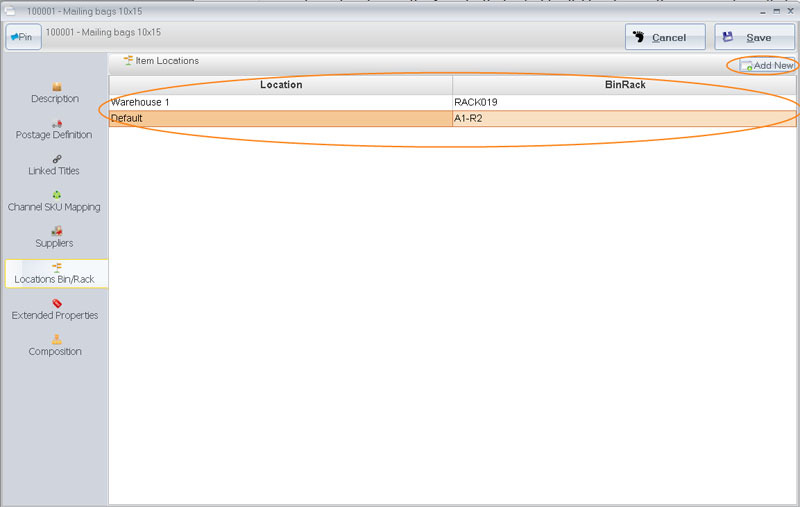 Each location in effect tracks a stock level independently. 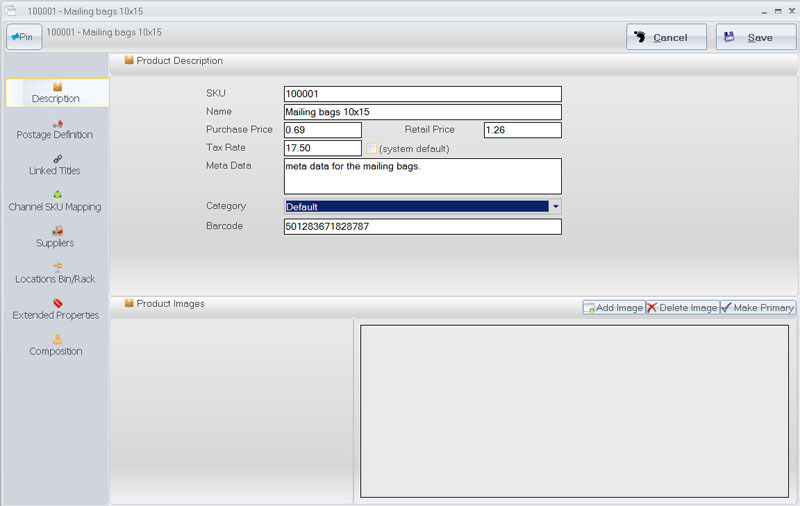 You can have stock item composition (packs, bunches, combinations, BOM products)– a stock item which consists of or includes other stock items. You can also adjust inventory levels, value and find stock which is running low from the same screen. 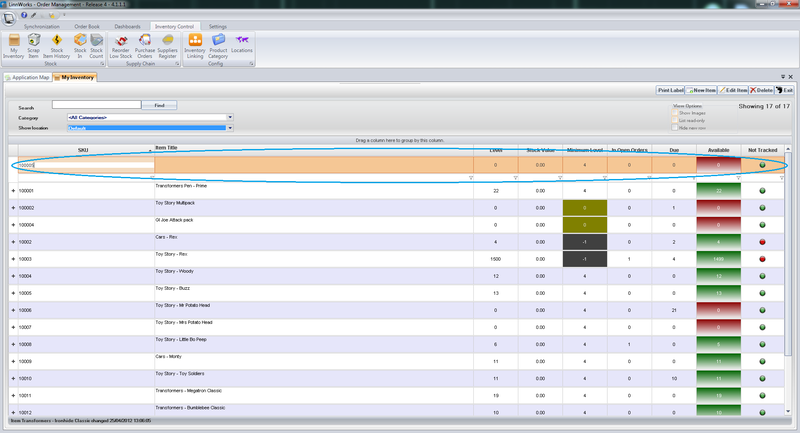 You can specify stock level, stock value, minimum level at the point of entry of the new stock item. Please note - you will only be able to see the stock level related fields if you have selected a Location from the drop down box in Show Location filter. Once the product is added you can enter more detailed info by editing the item. Alternatively you can click New Item button and enter the detailed product description. 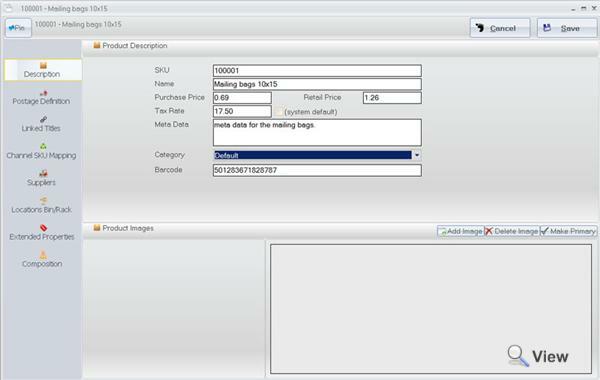 You can import batch stock items from a comma delimited file using data import utility. 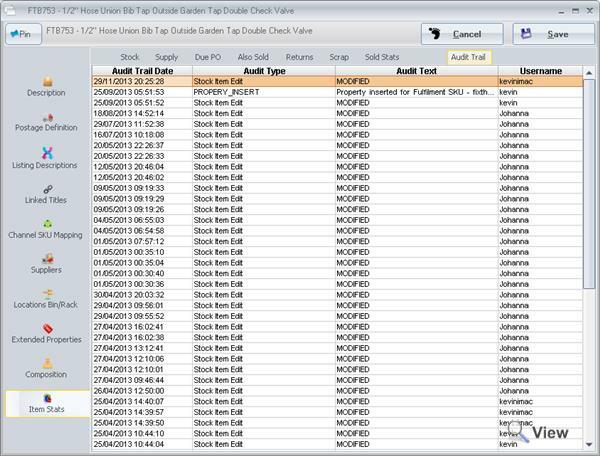 It is possible to create stock items from unlinked order. Find the item you would like to edit. Basic stock item details and item image. Here you can specify default postage details, weight and measurements of the package. The default Postal service defined here is for use with a custom order script to auto assign shipping based on a bespoke ruleset. An example Order Script to assign shipping can be found here. 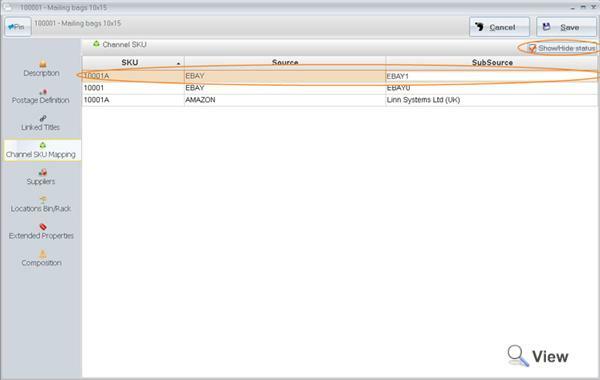 This section allows you to manage Linked Titles for the given stock items. 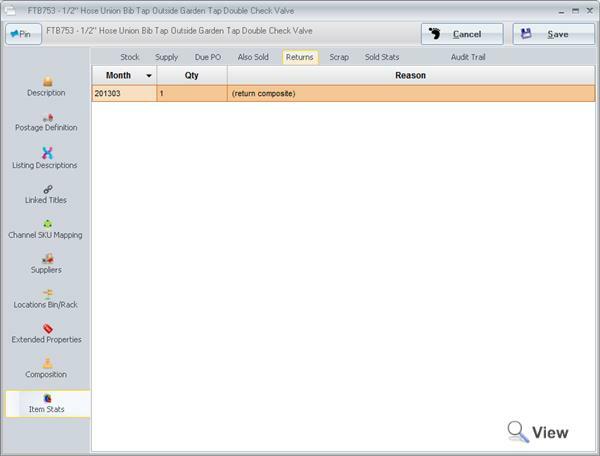 Linked title is a list of listing names which will automatically linked to this stock item when an order is downloaded from a channel (eBay, Amazon, PlayTrade etc). To add new linked title, click on the top row, enter the SKU (channel sku or custom label), Item Title and Source as EBAY, AMAZON, PLAYTRADE etc. To apply the changes hit Enter. 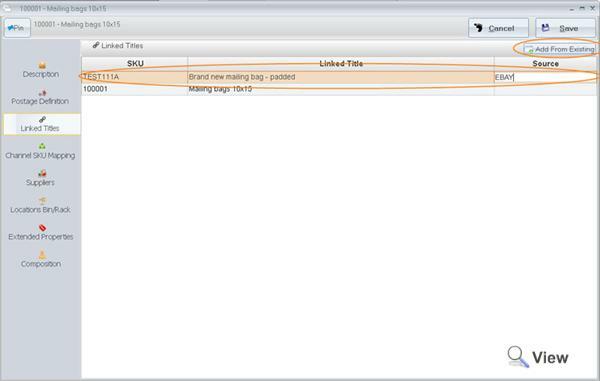 There will be a number of titles that have already been downloaded with order data from a channel. The easiest way to add already existing title click Add From Existing button, and double click on the title you want to add. To delete a Linked Title hit Del button. 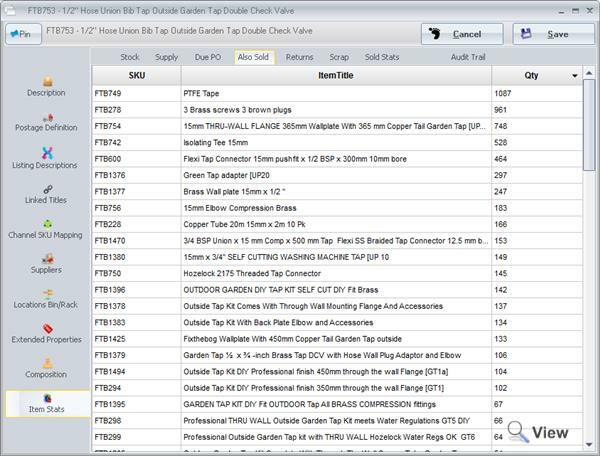 List of SKUs that will link to this stock item for orders downloaded from a channel. 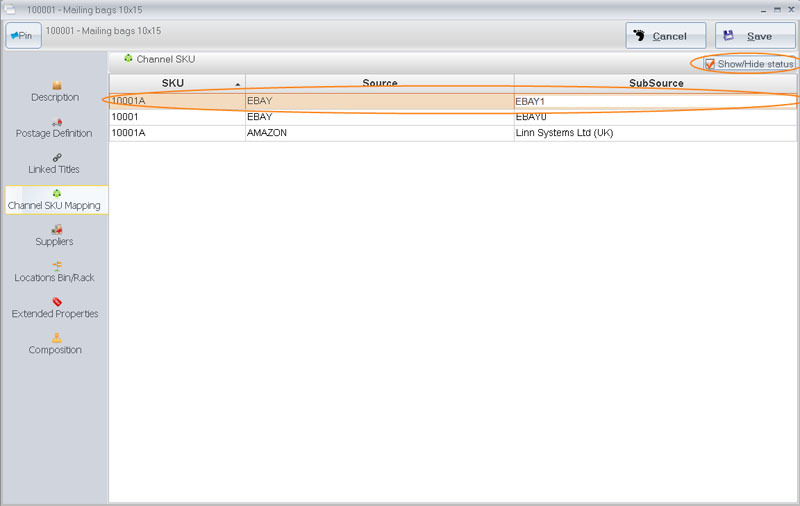 This table is also for Inventory synchronization. 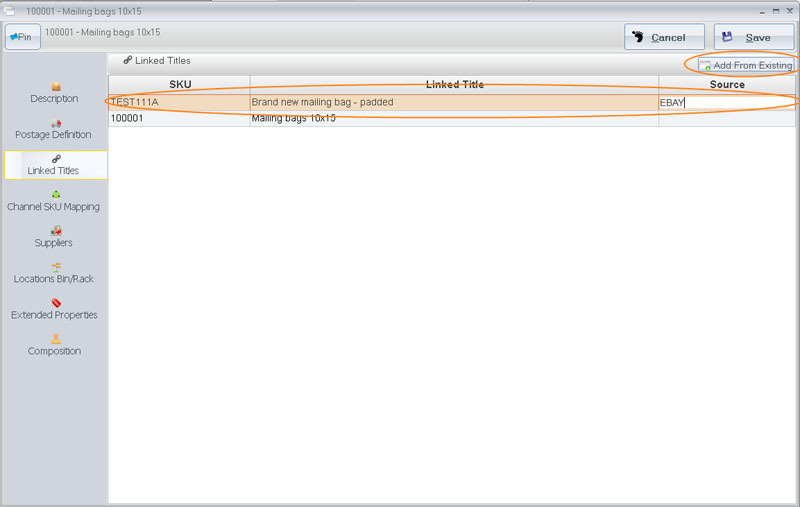 To add new linked Channel SKU, click on the top row and enter the SKU details including Source and Subsource. The Subsource for Amazon is a Merchant Name, for eBay is an account identifier i.e. EBAY0 or EBAY1 etc, for PlayTrade is a the Merchant Name. This is not applicable to websites and Megento integration as the Source will identify the exact channel uniquely, for example MAGENTO1 or WEBSITE2 etc. 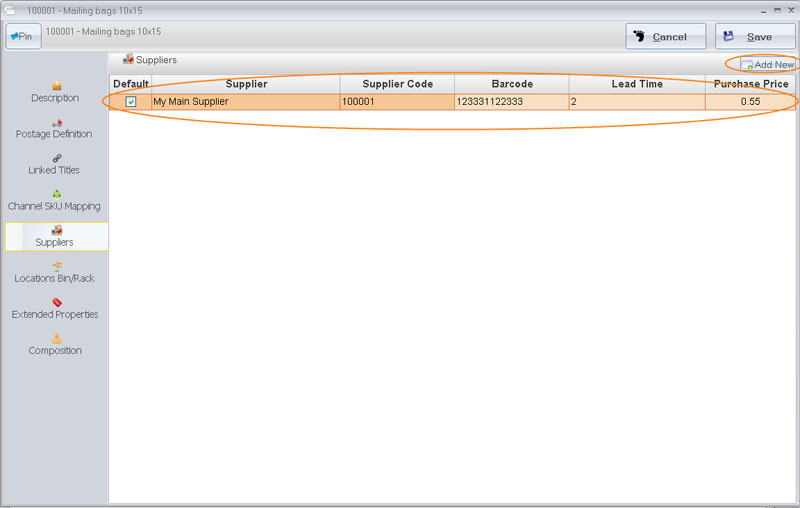 When Channel SKU is used for inventory synchronization, the last updated status will be recorded for each record. You can review the last status of the submitted inventory data to the channel will be available under Show/Hide Status. To delete a Channel SKU record hit Del button. List of suppliers and supplier associated details. 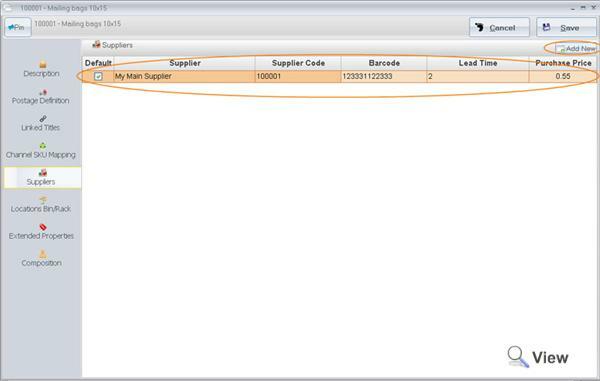 To add a supplier click Add New, then select the supplier from the list by double clicking the supplier. 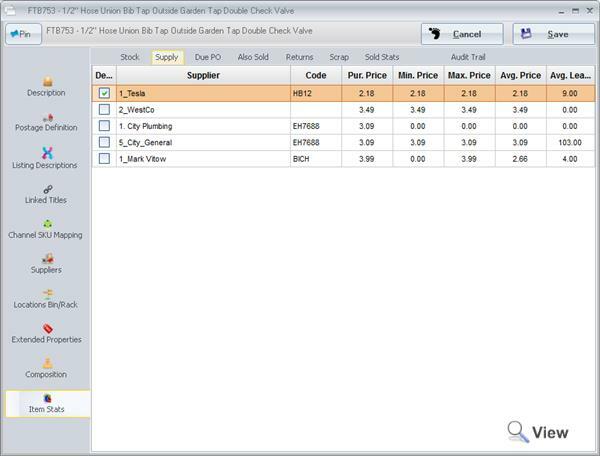 You can then edit the details such as Supplier code, barcode, lead time (the time it normally takes to source the product from a supplier), Purchase Price from the supplier by typing the values directly into the grid. At least one Supplier must be a default supplier – i.e. your preferred supplier. To delete a Supplier from the list hit Del button. You can add a list of locations for the selected item. 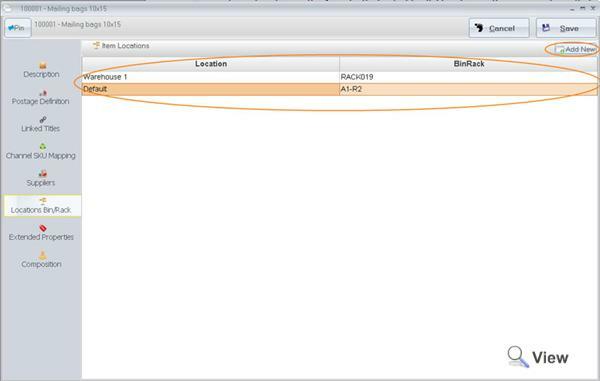 The main purpose for entering location is to identify the item's storage identifier such as Bin/Rack for every location. 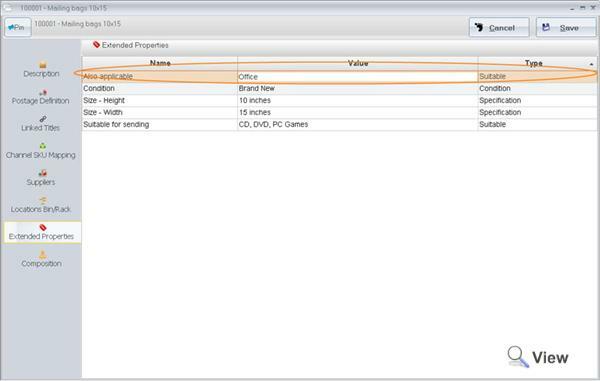 Extended properties is a list of custom values that can further describe the stock item. This table is used to create Specification tables when an item is listed on a channel using Linnlive service or create Item Specifics attributes. 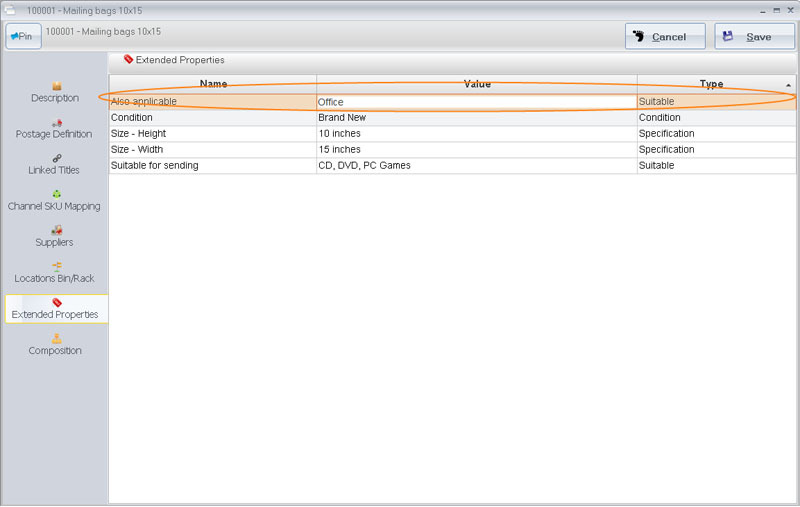 Each record in the extended property has a type (predefined in the system), Name of the property and a value. To add new extended property click on the top row, type Name, value and select Type from the drop down list. 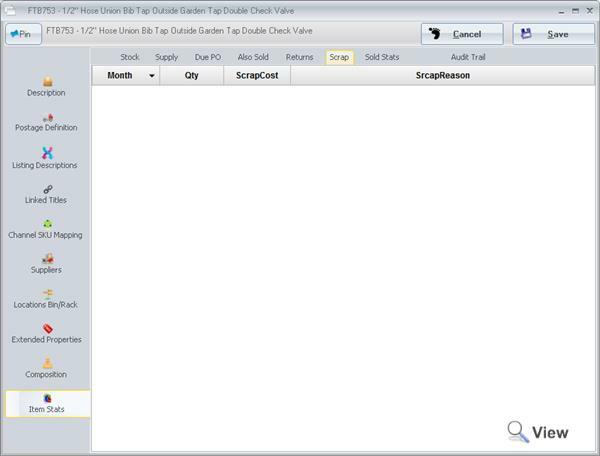 To add this column Right Click on the column headers and use column chooser to drag the column into the desired position in the grid.